The Rockville RSM12P packs a 12" Low Frequency and 1" High Frequency Titanium Compression Horn driver for a total of 1000 watts of peak power in a 30-pound package. This Rockville speaker features multiple hook up input and output terminals, low weight, and much more. Looking for a top-of-the-line stage monitor? The Rockville RSM12P is an incredible solution to your stage monitor needs. Capable of handling 1000-Watts of peak power this passive stage monitor sets a new standard in audio quality and high SPL playback. 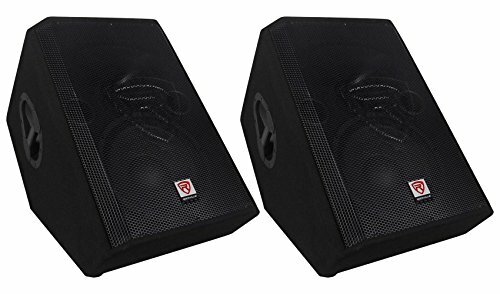 High-power 2-way pro sound stage monitor speaker system for live sound and playback applications with Wedge shaped enclosure provides the perfect angle for stage monitoring use.